Apple juice is loved by everyone irrespective of their age. Many of us are completely unaware of the true benefits of the power food. An average apple of about 100 gram weight has only 50 calories, fat free and sodium free. Rich in anti-oxidants, essential nutrients, and dietary fiber, apple is highly recommended by most health practitioners and fitness experts. Even there is a saying, “apple a day; keeps the doctor away”. Whether one is drinking it as part of daily diet, for health reason, just to quench thirst, or simply to enjoy the flavor of apples, apple drink is a favorite drink among people of all ages and groups. 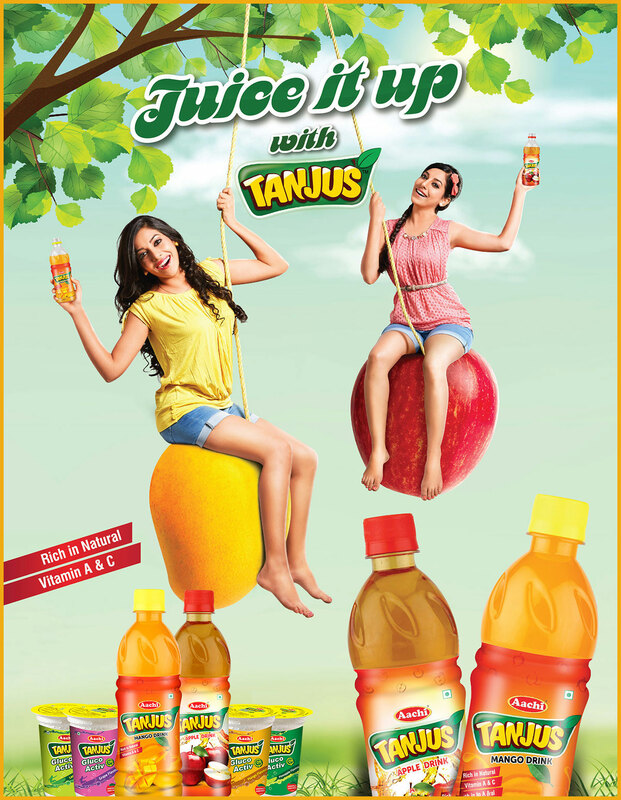 India’s No.1 Masala Brand, Aachi’s Tanjus Apple juice is a healthy choice for those who are looking to drink it regularly, as it has a pretty good content of vitamin C and is made out of 100% apple juice. The fresh quality apples are tree picked and then selected for quality and variety before they are inspected, cleaned and sent for processing. 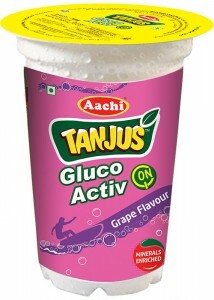 Tanjus apple nectar has been specially made to provide the essential nutrients required for growing children. This juice takes care of about 50% of vitamin C requirement of a child, in one glass of juice. In the apple juice there is no added colour and the juice gives complete natural taste. Thus it can be taken by everyone. 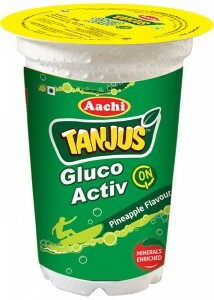 For the kids especially this beverage can be very suitable as this Tanjus Apple juice has no artificial components. All of these components are critical to keep the body revitalized and charged up to carry on the day-day activities easily. Tanjus apple juice is devoid of any fat and that is definitely an added advantage, This refreshing drink will send a stream of energy bursting through your body and boost your spirits as well. 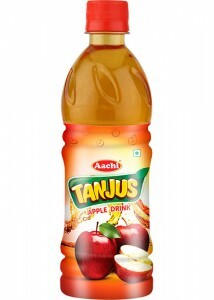 Aachi’s Tanjus Apple juice is available in trendy pet bottle of 200 ml and 500 ml. The “King of Fruits” Mango is considered as the one of the most delicious and healthiest fruits. This tropical fruit originated in Indian-subcontinent has been the regular part of human diet for thousands of years, owing to unique flavour, taste &aroma. 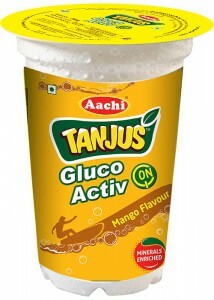 India’s No.1 Masala Brand, Aachi’s Tanjus Mango drink is not just a drink; it rekindles anyone with a lot of childhood memories. These drinks are designed to appeal the child in you and will make to feel like giving them a try, at least once. Tanjus Mango drink, uses selected, farm-fresh mangoes blended to perfection that just tastes like mythical, golden juice. Tanjus mango drink uses freshest Alphonsas mango pulp that will make you to believe that you’ve just bitten into a juicy mango.The rich colour, flavor, aroma and taste of this delicious Indian Fruit are retained by careful selection and delicate handling of the fruit. It gives the goodness of fresh delicious Mango anytime, in just a sip from the bottle. 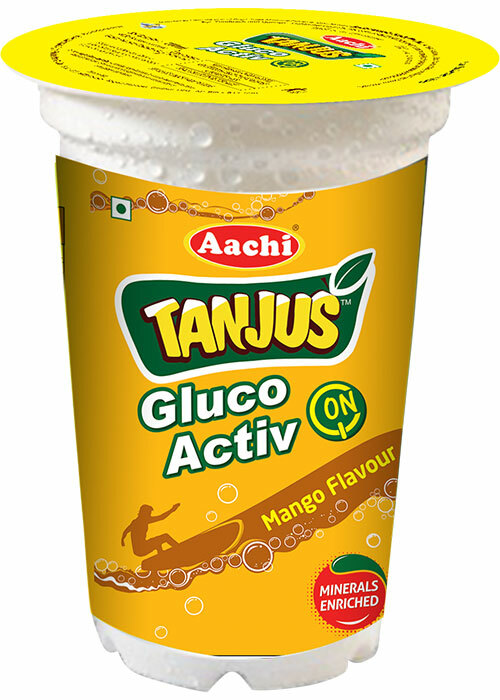 This mouth-watering heavenly taste of Tanjus Mango drink is good for health and loaded with Vitamins C & A along with traces of Vitamins B, E, and K, rich in iron, copper, and some valuable minerals. Even mothers can use this drink as a morning and evening snack for their children, because of healthy diet. 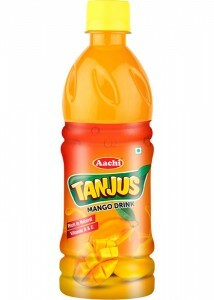 Aachi’s Tanjus mango juice is available in trendy pet bottle of 200 ml and 500 ml. 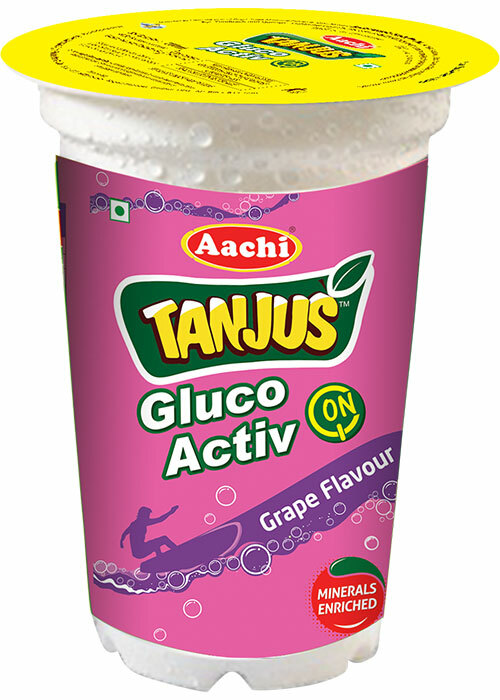 Tanjus Gluco Activ ON, a refreshingly new energy drink for newer generation, the exciting New Refreshing Grape Flavor of Gluco Activ ON contains glucose to provide instant energy, minerals and antioxidant to refresh your body and replenish lost electrolytes. Tanjus Gluco Activ ON, a refreshingly new energy drink for newer generation, the exciting New Refreshing Mango Flavor of Gluco Activ ON contains glucose to provide instant energy, minerals and antioxidant to refresh your body and replenish lost electrolytes. 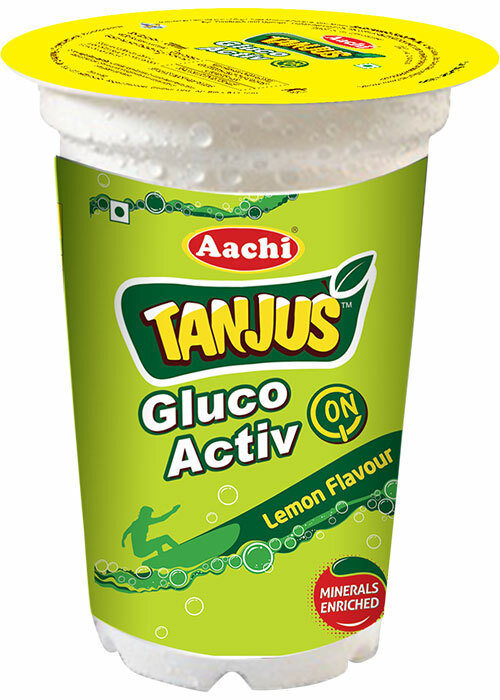 Tanjus Gluco Activ ON, a refreshingly new energy drink for newer generation, the exciting New Refreshing Lemon [100% Natural] Juice of Gluco Activ ON contains glucose to provide instant energy, minerals and antioxidant to refresh your body and replenish lost electrolytes. 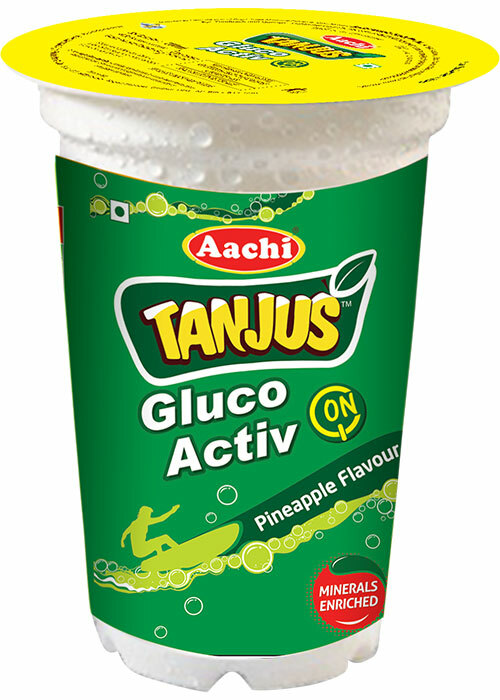 Tanjus Gluco Activ ON, a refreshingly new energy drink for newer generation, the exciting New Refreshing Pineapple Flavor of Gluco Activ ON contains glucose to provide instant energy, minerals and antioxidant to refresh your body and replenish lost electrolytes.